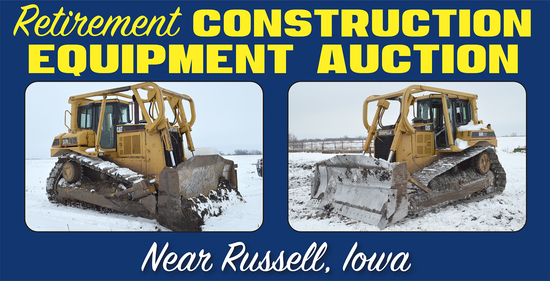 Selling dozers, excavators, loader backhoe, tractor, scraper & roller, tiling equipment, trucks & trailers, laser equipment, farm equipment & shop tools. Driving Directions: At the south edge of Russell, Iowa, continue on Hwy. S56 7 1/2 miles to the auction. Be watching for sale day directional signs that will be posted on US Hwy. 34. Big Ox Blade, 8', 3-pt.